"I am interested to have three teapots - all three should hold 50-70ml. 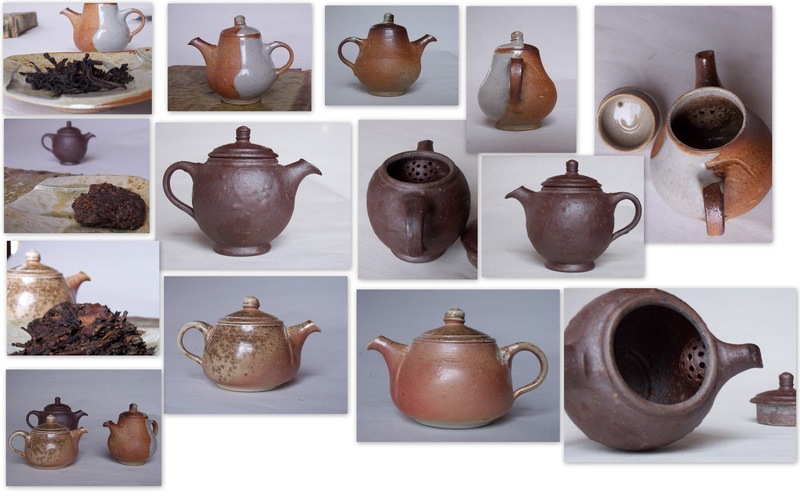 Materials and glazes are up to you - if it will be OK with you I would like to ask you to make those teapots in order to fit to tea I going to use them for. The First should be for ShengPu, the second for ShuPu and the third for Yancha oolongs. I have only few thoughts...Lids shouldn't be sunk but rather wider then opening so I can pour hot water on it during my brewing. I prefer ball-shaped forms with as wide opening as possible for the size. Only the one for YanCha rather taller as it will be better for longer leaves of some teas of this kind. I am not in hurry - when those teapots will be ready I would like ask you to send them to me without showing even pictures - I look forward to surprise when I will open the box from you. " I was quite sure about material for ShengPu. Combination which I have on the teapot I use for my Shengs. Technical porcelain with celadon glaze inside. Ash and fire decorated it during firing - only small flowery stamp from me on the side of the handle. 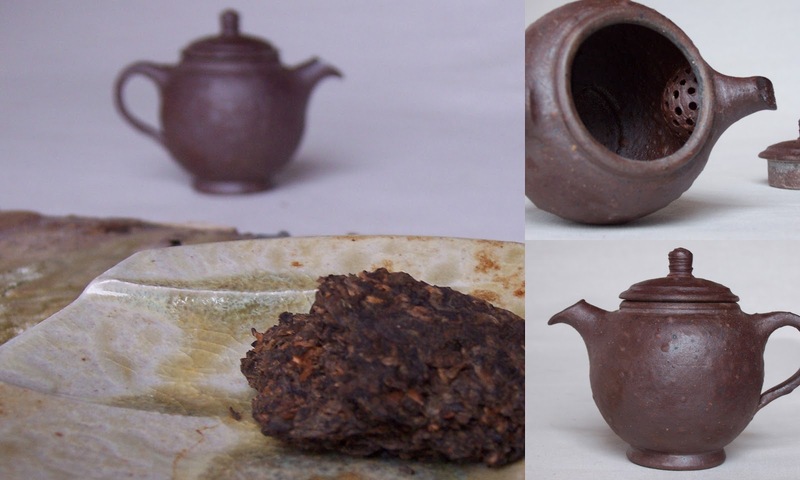 Thinking about pot for Shu Puer I realized that it should be more spherical. I usually use bigger (150ml) teapot or shiboridashi for my Shu so I am really curious how it will work. High iron clay will help to smooth out brews - I have left it without glaze. The teapot for YanCha was challenging. 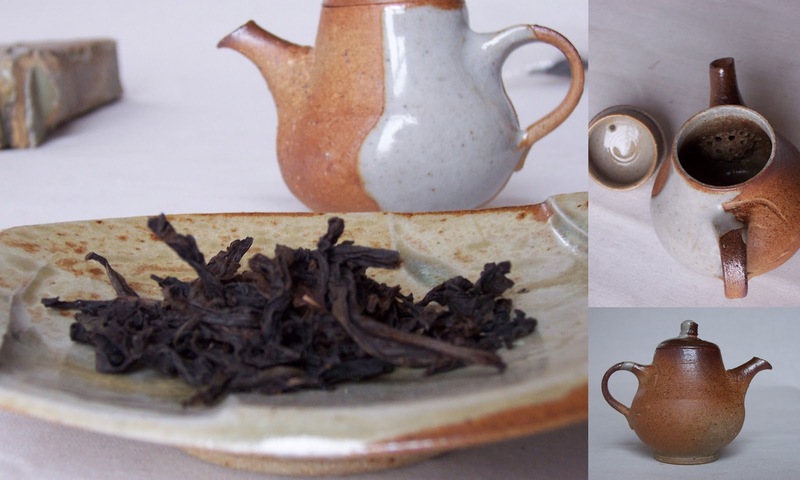 How can I create the right teapot for Wui oolong with no experiences with them? Ok, I had some experiences but most of them with over roasted, low grade teas with not many character. First I find old issue of The Art of Tea magazin with several interesting articles focused on Wui. Then going through and enjoying several samples of different cultivars, from different years and different suppliers I find out that "Wui compartment" is something what is definitely worth to pay attention. My customer already unpacked the box with his new teapots and I am happy that his first sensations are good. I look forward to hear if clays and shapes of those small pieces richen his tea sessions. Last but not least I would like to mention new tea testing. New for me of course. When I was thinking about this post I thought it would be interesting to show, as kind of illustration, liquor of each tea. Finally I decided to prepare all teas at a time. I didn't use teapots made for my customer but my small teapots and Peter Fulop’s and two Korean cups. It is very interesting -smelling to three different teas, to wet leaves, see and taste infusions. Compare beyond compare. Happy moments. I am using one of your teapots, somewhat similar to the first one in the post, for sheng! I used it for a few young sheng. The strainer style makes it pour very fast, which I like very much! I've used the mini Japan shibo for sheng too, also great and fast pouring! 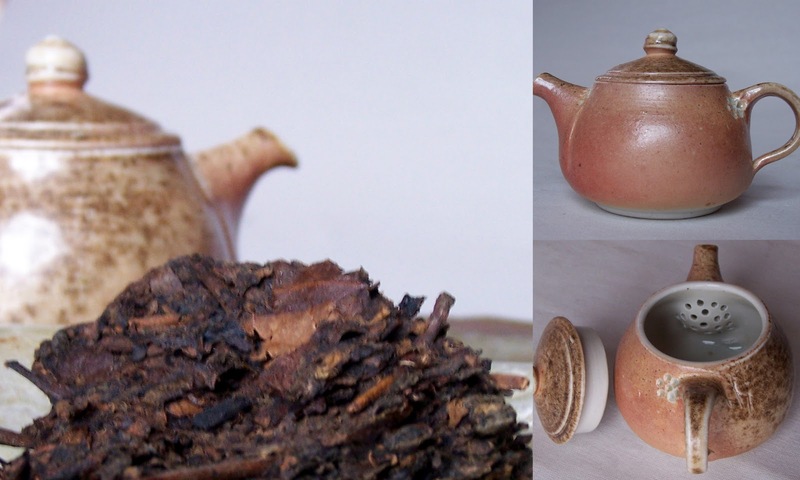 Fascinating to read how you approached the creation of the three tea pots, and particularly impressed that you would spend time researching the wuyi oolongs to help inform the making of the pot. If only I could now taste from each of them :) Beautiful work, as always Petr. Gingo - I am glad you also find this combination good for your sheng. And you are right - for young it is even better. My impression is that it "reflects" fragrances which are more important for young tea but on other hand it is not so "cold" as factory products. Learning to pull redishes - It is not like that with every single teapot of course. We have saying which translated can be something like "it is only the cherry on the cake" . And I am also looking for ways how to make work (live) pleasant. These teapot are really beautiful. Especially the third one- has a interesting traditional shape (bell or pear), similar to some yixing teapots. I find a big pleasure in admiring your works. Thank you and welcome neighbour. Pear shape is new for me. hope to work on that more in the future. I am potter focused on creating tea ware. The blog Pots and Tea is here to be a part of my wandering on the way of tea and clay. Dragon of the East Sea part II. Fate un'esperienza di cerimonia del tè privata solo per voi! Deep Tea | Sloshing towards a contemplative tea practice.